RIM plans to unleash 7 new smartphones in "the coming months"
RIM co-CEO Jim Balsillie recently stated they have “absolutely have a whole next generation of smartphones” coming. Yesterday at their Annual Meeting of Shareholders it was also declared that this next generation of smartphones will see the light early 2012. This is when they are expecting to release a lineup of “superphones” based on the QNX platform (the OS that currently powering the PlayBook”. 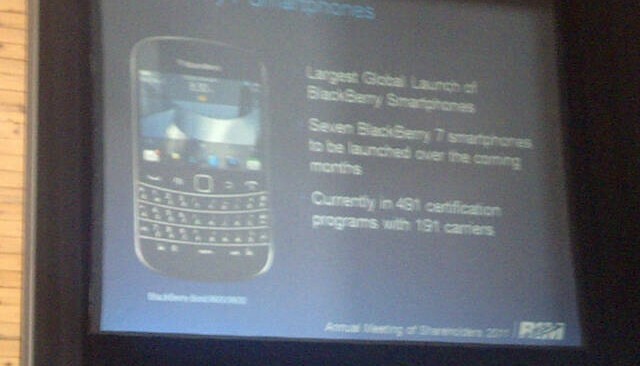 RIM also announced yesterday that they have a total of 67 million BlackBerry subscribers, 45 million BlackbBerry Messenger users and that 7 new devices will be “launched over the coming months”. It’s known that the BlackBerry Bold Touch 9900, Torch 9860, Torch 9810 and Curve 9360 are all coming to various Canadian carriers soon, but no news on what the other handsets are.